MonoDevelop 2.2 Beta 1: We go cross platform. Since the beginning of time, man has yearned to get a cross platform .NET IDE. Homer's Odyssey described one man's effort to achieve such a thing. And it was not until today, September 9th of 2009 that the world can test out such a tool. With this release MonoDevelop leaves its cozy Linux nest and embarks on a wild adventure into the hearth of MacOS and Windows. The MonoDevelop team made this one of their major goals for this release: to turn our loved IDE into a cross platform IDE. If you are curious about the details, check out the What is new in MonoDevelop 2.2 page. We are not only bringing MonoDevelop to OSX and Windows as a plain GUI port, but we are also providing installers, deep operating system integration and support for native debugging on each platform. 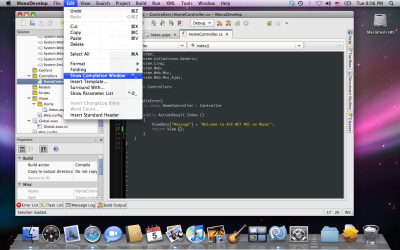 In addition to becoming a cross platform IDE, there are many new features in MonoDevelop. 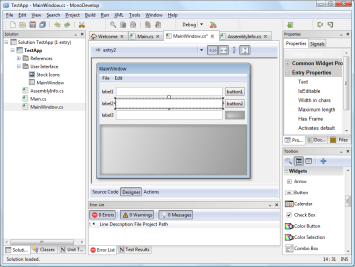 For instance, MonoDevelop can be used to develop ASP.NET MVC applications on OSX and Linux and Silverlight applications on OSX and Linux. MonoDevelop now has integrated debugger support. Not only it is able to debug Mono applications, it also can work as a frontend to GDB to debug native applications. In addition, on Linux it is possible to debug ASP.NET pages. New exciting add-ins: ASP.NET MVC, Silverlight and iPhone (for use with MonoTouch). Extensive refactoring support. And I mean, it is extensive. VI mode for those users hooked up on VI commands, they can now use those within MonoDevelop. Another pretty cool feature is the code generation support that is triggered with Alt-Insert. When you press Alt-insert it will popup a context sensitive dialog box that offers a few options of code that could be generated at this point: ToString methods, Equals/GetHashCode methods all based on existing fields and properties. Going cross platform means that developers will have the same tool across all of the operating systems they use: Windows, Mac and Linux. .NET developers that have been enchanted by OSX will be able to continue developing software with their favorite programming languages while enjoying OSX and will be able to go back and forth between Windows, OSX and Linux as needed. This also means that they can work with developers in other platforms, regardless of the personal choices of other team members. As many of you know, the number of contributors to a project is linked to the number of users of that project. By expanding our market presence from Linux, we expect to get contributions, fixes, improvements, bug reports, code and add-ins from developers in other platforms. We intend to make MonoDevelop the Eclipse of the .NET community. Just like Eclipse became the foundation for Java development, we hope that MonoDevelop will become the foundation for .NET development, and hopefully for much more than that. We are not religious when it comes to supporting other programming languages . We want to embrace not only .NET-based projects like Gtk#, Silverlight, ASP.NET, Boo, C#, F#, Visual Basic and Windows.Forms. We are also embracing other developer platforms like Python, C/C++, Vala, and we want to expand our presence to work with the Flash, PHP, Ruby, Rails, Flex and any other communities that need a cross platform IDE. we are just religious about the fact that C# is a better programming language to build an IDE than Java is. This release could not have been possible without the endless nights and the collaborations of our contributors and all of the end users that reported bugs and gave us feedback.